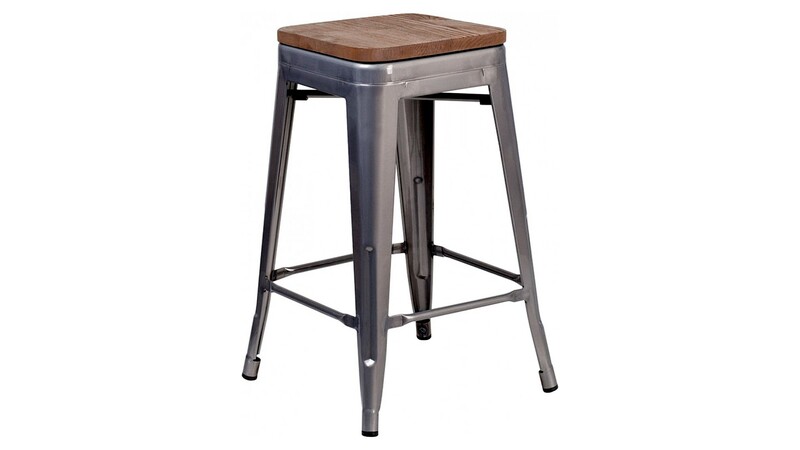 Save on space with this Clear Coated Backless Metal Counter Stool with wood seat. The clean lines and simple design of this square, industrial style stool will look great in your kitchen or inside your bar or restaurant. Designed to stack, this stool is an ideal choice in the restaurant industry. A cross brace underneath the seat adds extra stability and features plastic caps that prevent the finish from scratching when stacked. The lower support brace doubles as a footrest, and floor glides protect your floor by sliding smoothly when moving it. Designed for both commercial and residential use, this counter height stool will provide refreshing rustic feel with its metal and wood features.